As a high school student in Waterford [Connecticut] in the late 1950’s, A.Vonn Hartung had a few items ahead of sports on his list of interests: fixing up an old hot rod, chasing girls and shell-fishing, to name a few. 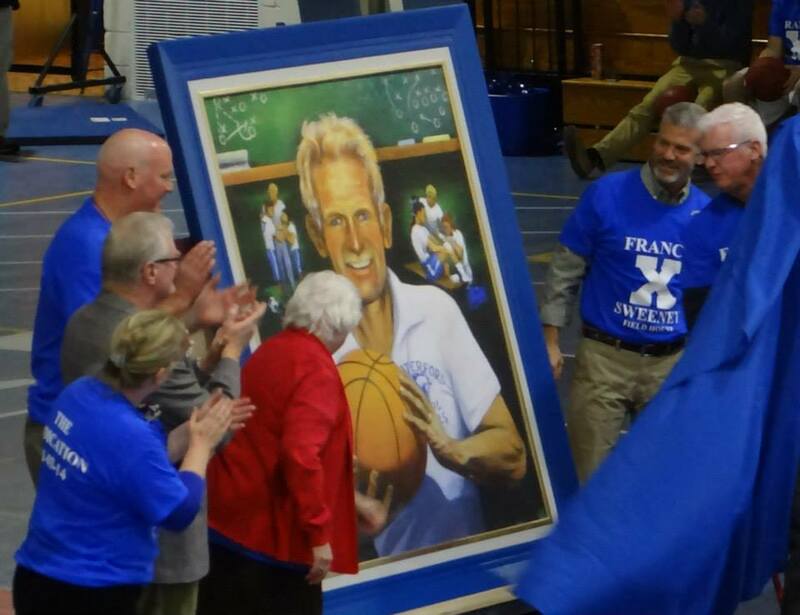 Nonetheless, Hartung was close with Francis X. Sweeney, the school’s athletic director, coach and teacher. 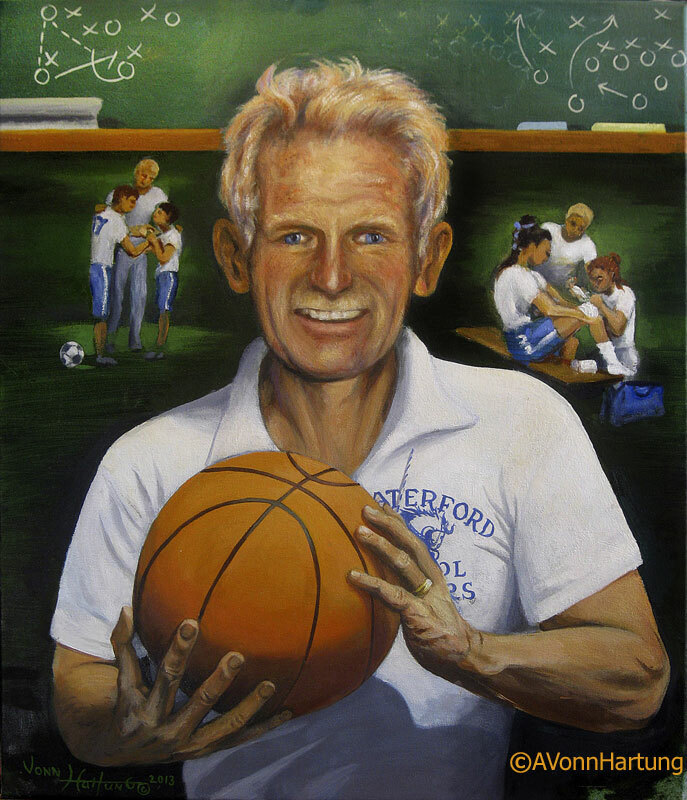 As its first athletic director, Sweeney, who died in December 2012 at the age of 86, was integral to the foundation and development of Waterford High’s athletic department. For 18 years, he coached basketball at the school, but he coached nearly every sport at the school as well. 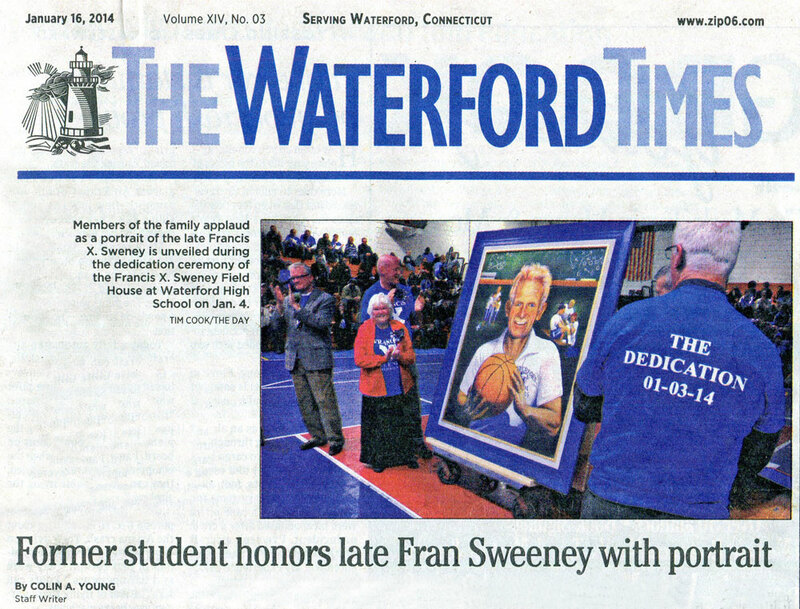 And on January 4, the town held a ceremony to officially name the high school’s field house in honor of Sweeney. 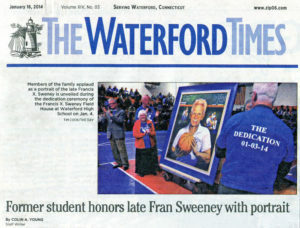 Along with a plaque, town officials unveiled a large portrait of Sweeney that will hang near the field house entrance. 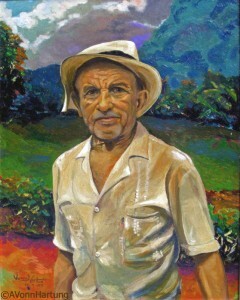 The portrait was painted by Hartung, who for about three decades has lived and worked in Puerto Rico. The portrait, painted with oils on canvas, shows Sweeney in the foreground holding a basketball, as if he were inviting the viewer to join him to shoot some hoops. Sweeney is actually represented three times in the portrait. Once as the primary focus of the painting and twice in the background. Over each of Sweeney’s shoulders, Hartung painted small vignettes of the coach and mentor. On one side, Sweeney is helping two students work out a difference. On the other, he is shown in another of his many jobs: athletic trainer. And in the background is a chalk board displaying diagrams of two plays, like a coach would draw up before a game. 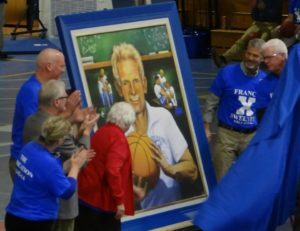 Though he expects the portrait of Sweeney to hang in the high school for many years, Hartung said he would like to see Sweeney’s legacy continue in another way too: a scholarship fund. Since Waterford’s 1801 incorporation, there had been a moratorium on naming buildings for people. But in September, the Board of Education changed its policy regarding the naming of facilities. And on October 29 it unanimously approved the name for the field house. Hartung, along with other Waterford High School alumni, used Facebook to circulate a petition and to share memories of Sweeney. Through the process, Hartung said, he was able to reconnect with old classmates, other high school alumni and Sweeney’s family. gazing at the saint statues in St. Joseph’s and St. Mary’s Churches in New London. The art in these two local parishes inspired Vonn, a Waterford native to dedicate his own artistic talent to Christ. Today, Vonn lives in Puerto Rico where he has fashioned about 46 works, including murals, paintings, serigraphs and sculptures. 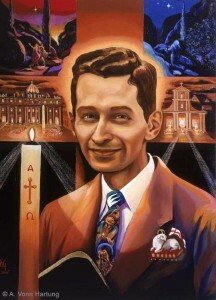 One of his paintings, a portrait of Blessed Carlos Manuel Rodriguez, commissioned by the archbishop of San Juan, now hangs in the Hall of Saints in the Vatican. Before he moved to Puerto Rico permanently in 1984, however, Vonn ran a woodcarving studio in the old velvet mill at the Mystic Seaport. During that time, he carved a crucifix for St. John’s in Montville and two cruciforms and a hymn board for Our Lady of Lourdes in Gales Ferry. 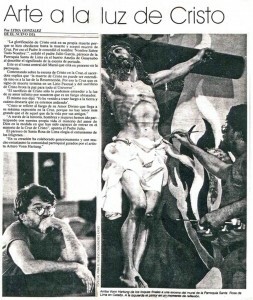 Monsignor Bronislaw Gadarowski, who was pastor of St. John’s in Montville from 1972 to 1989, recalls a corpus of Christ on the cross that Vonn created when the church was renovated. Monsignor Gadarowski said he used to put the corpus on a violet background during Lent for parishioners to view. He said they used to comment on the look of excruciating pain on Christ’s face. 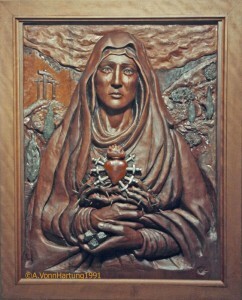 Indeed, Vonn said prayer inspires each brush stroke or cut of the sculptor’s knife. He said he prays constantly while he works asking, “mostly that I will do the will of my Creator and not get myself in the way of His expression. I would not be able to do my work without a deep faith. Vonn, who earned a bachelor of fine arts degree from the University of Hartford, first traveled to Puerto Rico in 1961. 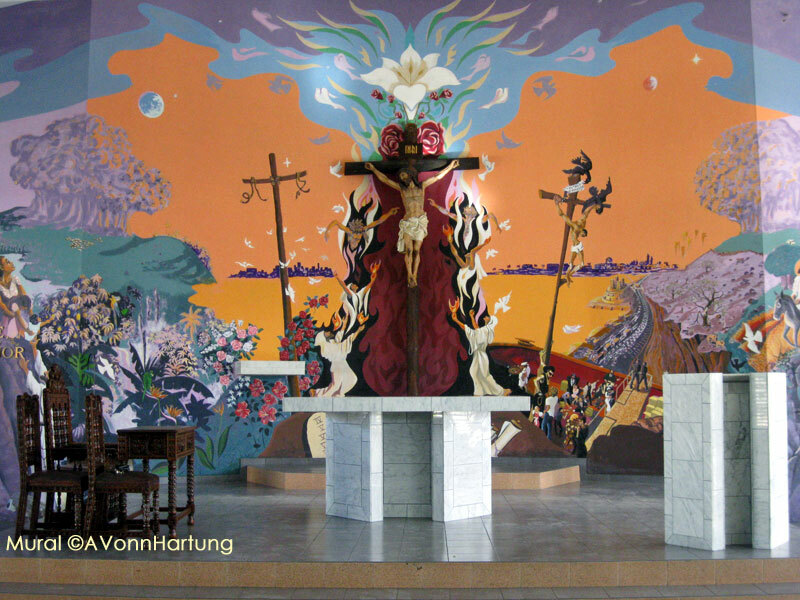 Most recently, Vonn completed an 18-by-50-foot mural behind the altar in the Church of San Juan Bosco in Orocovis. Entitled “The Dream of the Two Columns,” the colorful painting details a dream St. John Bosco (1815-1888) had about the Church. The Italian priest, visionary and founder of the religious order of the Salesians of San Juan Bosco, said the dream foretold the trials the Church would face, yet survive, through faith and the power of the Holy Eucharist and Mary’s intercession. 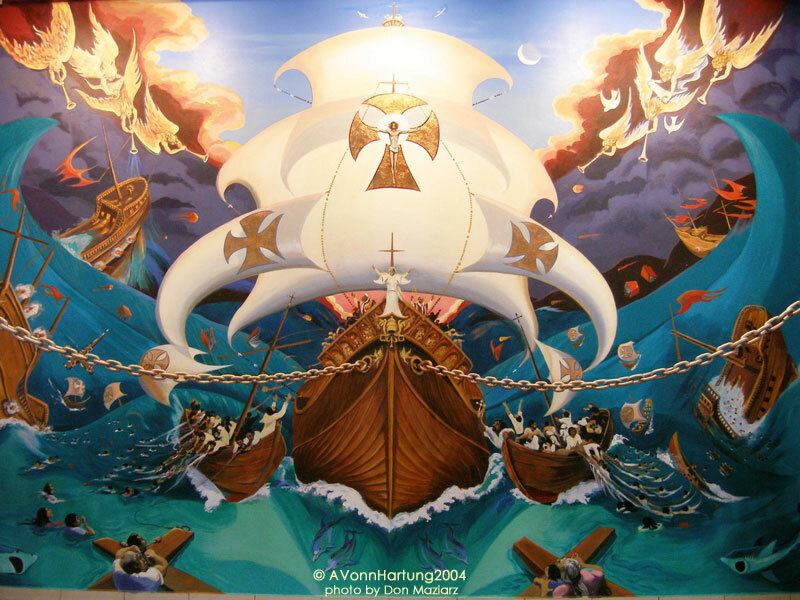 In the mural, as in the dream, the Pope pilots an enormous ship that is under attack from enemy galleons shooting – anti-Catholic books pamphlets and other untruths. As the ship flounders in a fierce storm, the pope anchors it to two columns. Atop one column is the Holy Eucharist and atop the other a statue of Mary Help of Christians. Currently, Vonn is painting “The Way of Light,” the 14 Stations after the Resurrection of Jesus, on the windows surrounding the nave of the Church of San Juan Bosco. Vonn said he hopes that his work “may in some small way contribute to the growth and stability of our church in our own time, and that it might inspire others to see the beauty in our Christian truths. “I am convinced that there is great art left for us to do —for our time, our place and for our church,” he said. He is relatively unknown. But on Sunday Carlos Manuel “Charlie” Rodríguez will make history, becoming the first Puerto Rican and second layperson in the Americas to be beatified by the Roman Catholic Church. Beatification is a process through which the church recognizes a deceased person as worthy of public veneration. It is a step toward being declared a saint. Rodríguez was born in Caguas, Puerto Rico, on Nov. 22, 1918. He was one of five children born to a poor, devout Catholic family. Not many Puerto Ricans living in southeastern Connecticut have heard of Charlie yet, but he was a pioneer and patron of the liturgical movement in Puerto Rico. About 2,000 people from Puerto Rico are traveling to Rome for the beatification ceremonies. Rafael Ortiz of Norwich will be making the pilgrimage to Rome. He knew that he could not miss this once-in-a.lifetime experience. A. Vonn Hartung, an artist from Waterford who has lived in Puerto Rico for the past 16 years, was commissioned by a Cuban priest, the Rev. Julio Garcia, to paint a portrait of Rodríguez. Hartung interviewed Rodríguez’s friends and relatives so he could get a sense of who he really was. When he showed the finished portrait to Rodríguez’s two sisters, who are now in their 80s, they were silent, he said. The portrait is painted with various symbolic elements, which Hartung said express a visual prayer. Charlie, he said, tells us to listen for the call of the Lord, which is symbolized by an open door. “The light from the path falls upon his left shoulder and leads us to the lamb, symbol of his Savior, and (to) his beloved land, Puerto Rico,” said Hartung. The archbishop of San Juan, Mons.Roberto González Nieves, commissioned Hartung to paint a second portrait of Rodríguez, which will be presented at his beatification in Rome. It is similar to the first portrait except it is bigger and has St. Peter’s Basilica and the Cathedral of San Juan in the background. At the Centro Universitario Católico in Rio Piedras, Rodríguez taught priests, religious sisters and brothers and laypersons about the doctrines of the church. He directed three discussion groups in three towns, conducted religious classes and published a weekly liturgical bulletin. Priests who listened to him explain philosophical and theological concepts said they never heard a person so brilliant in those fields. In 1997 Pope John Paul II declared Rodríguez “Venerable,” which means that he lived an extremely holy life. Two years later the Vatican officially recognized that a woman who had terminal cancer had been miraculously healed in 1981 after prayers to Rodríguez for healing. Rodriguez would have to perform another miracle after his beatification before he can be officially deemed a saint. The bishops of Puerto Rico declared the year starting on April 29, 2001 and ending this Sunday as the year of the Blessed Carlos Manuel Rodríguez. Churches in our area are also spreading the word of Charlie’s beatification. Sister Mary Jude Lazarus, director of Hispanic Ministries for the Catholic Diocese of Norwich, said that many Puerto Ricans outside of Puerto Rico have not heard of Rodríguez. She said the parish of Sagrado Corazón de ,Jesus Iglesia in Willimantic would have a Mass on Saturday and a celebration afterwards, in honor of Rodríguez’s beatification. At St. Mary Star of the Sea Church in New London, following the 11:30 am. Spanish Mass Sunday, there will be a special fiesta which will also feature the videotape of Rodríguez’s life. Cards with a special prayer for Rodríguez will he distributed. In a secular century, when “icon” means a bright little computer cartoon to click with a mouse, Vonn Hartung’s art talks with the vocabulary of allegory. Across the sanctuary of Santa Rosa de Lima Church in his adopted hometown of Guaynabo, Puerto Rico, Hartung is just finishing an 80-foot mural. Jesus crucified looks upward to a resurrection decked with thornless roses. On his right the good thief’s cross is empty because he has already gone to heaven; on the other side is the crucifix of the thief who scoffed, with an assault rifle as the crosspiece. Noah’s ark navigates an environmental deluge of pollution, and parrots of endangered species roost in the Tree of Life. Hartung, who has lived in Puerto Rico since marrying his wife, Patty, in 1984, came home to Waterford last month for a reunion with his high school classmates, who knew him as “Joe.” At age 56 he is about to have his first exhibition, yet he has been an artist all his life. Hundreds of people see his work in churches and chapels every week. They know what his symbols are saying; he speaks their language. “The church was my art museum,” says Hartung, recalling his childhood parish of St. Joseph in New London in the ornate days of the 1950s. Although he is currently painting partially abstract, stream-of-consciousness oils with more obscure symbols, for 20 years Hartung has been interpreting mysteries of faith with graphic literalism. 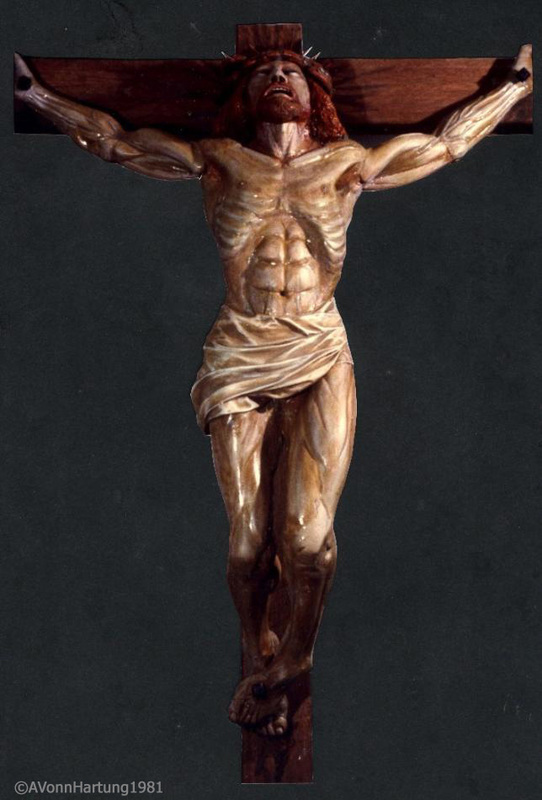 A life-sized woodcarving of Christ on the crucifix, based on a doctor’s detailed description of how a crucified man would die, used to hang in St. John’s Church in Montville. Some parishioners, says Hartung, found it too graphic to contemplate. The power of one of his carvings, a tabernacle door, came home to him in the comments of a priest who opens the door every day during Mass at a boys’ home in Puerto Rico. 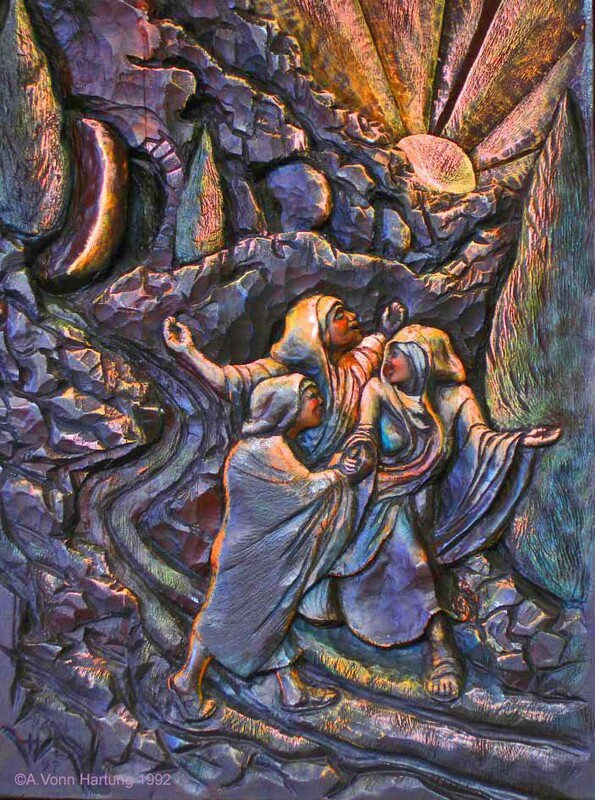 The bas-relief carving, “He is Risen,” depicts the hillside of Jerusalem where Christ was buried. The rising sun shows it to be Easter morning and three women portraying hope, unity and joy walk down the path. The grave is empty. 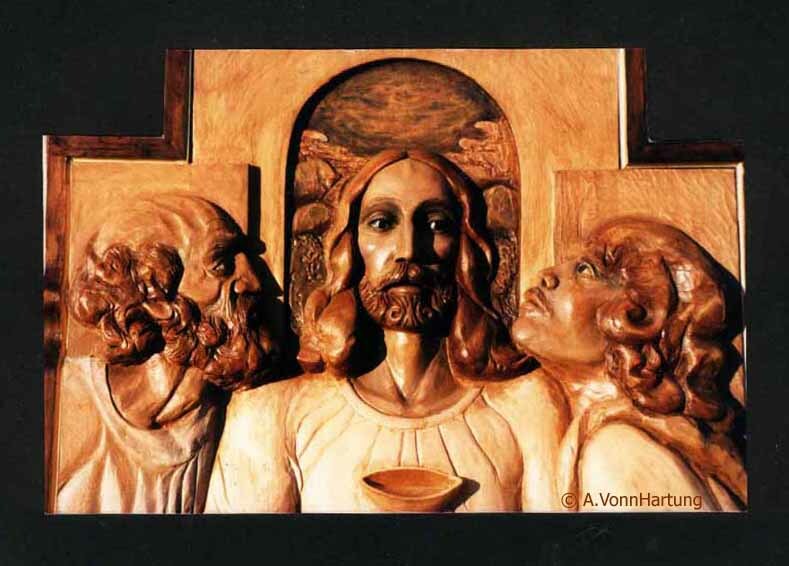 Hartung sculpted it out to serve as the handle of the door, and every time the priest opens the tabernacle, he must put his hand into the tomb. 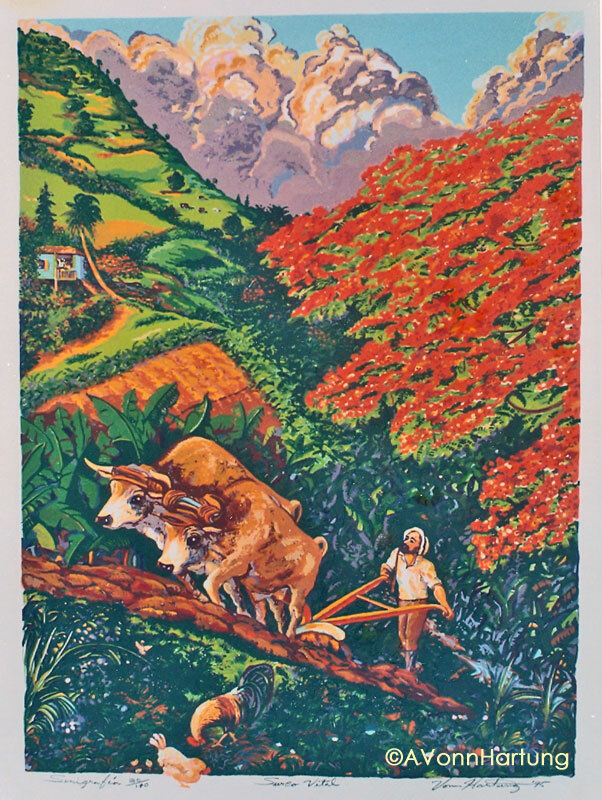 In Guaynabo, Hartung works full time on his sculpting and painting, including non-religious commissioned portraits and serigraphs—original prints—of rural Puerto Rican landscapes and people. He holds a Bachelor’s degree from the Hartford Art School at the University of Hartford, but he says he didn’t paint in the five years after he graduated because “I kept thinking of other artists,” instead of his own vision. Hartung’s artistic heroes are Michelangelo, Harry Rodvogin and his late father, Arthur J. Hartung Sr. He took the first name Vonn after his grandfather, but he was formally named after his father, who painted exactly one painting in his entire life, on the back of a kitchen table cloth. The family framed the image of a ship under sail and it still hangs, badly cracked from the deteriorating oil cloth, over the mantel at the Waterford home of Hartung’s mother, Phyllis. pointed out Father Julio Garcia, pastor of Santa Rosa de Lima Parish in Barrio Amelia, Guaynabo, describing the meaning of the scene on the front page. This is the central theme of the mural that is underway in the parish. Commenting on the scene of Christ on the Cross, the priest explains that “the death of Christ can only be understood in the light of the Resurrection. Therefore the Cross which is a symbol of death ends in an Easter Lily and from Christ’s sacrifice flows peace for the whole universe. “The sacrifice of Christ can only be understood in light of his infinite love for us which is a burning fire. He himself said: ‘I have come to bring fire to the earth and how I wish that we were already burning’. “Throughout history, we men and women have been participating with our own lives in the mystery of God’s love to the extent that we have been able to enter into the mystery of the Cross of Christ,” said Father Julio. The pastor of Santa Rosa de Lima praises the enthusiasm of the parishioners. The parish community has generously and enthusiastically collaborated in its creation [of the mural], guided by the artist Arturo Vonn Hartung. 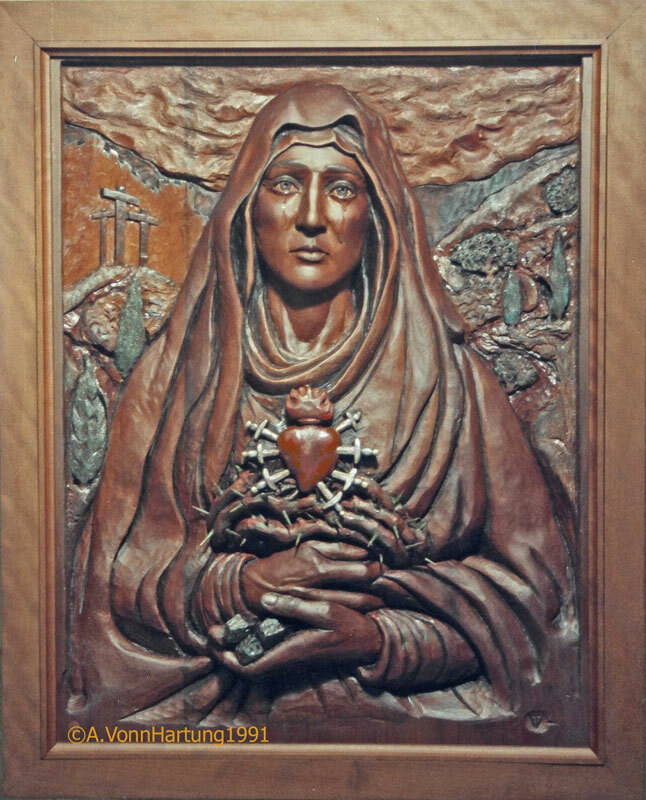 This was the incredible but true news that the first believers transmitted from one to another two days after they saw him dead on the cross..
A. Vonn Hartung painter and sculptor, has molded this historic fact into a moving wood sculpture carved on the sacristy door in a chapel in the metropolitan area. This work, entitled “He is Risen”, forms part of an ensemble which also includes “The Holy Cross” and “The Sorrowful Mother”. Joy! The Christian world praises and gives thanks to God for this event; the beginning of the Good News of Jesus Christ, Son of God. And many are the paths that Vonn has traveled before he arrived in Puerto Rico, a place he did not know, but to which he yearned to come and make his home. “I knew it was a beautiful place,” he admits, although he didn’t know anything or anyone on the island. So on a stormy day in 1961 he left Connecticut with $300 in his pocket and arrived in San Juan. “I’d like to find a place to stay,” he said to an airport official. “For how long?” they asked him. “I’m going to live here,” he answered. After many phone calls they found him a place for $3.00 a day. Since he was very young Vonn always knew that he wanted to dedicate himself to painting and he wanted to study in Puerto Rico. The first thing he did was to go to the University of Puerto Rico. He brought a portfolio of his works.“I would like to study art, but I don’t know Spanish,” explained Vonn.” “You don’t need it; you speak the language of art. That’s all you need,” they told him. They accepted him as a visiting student. His first art teacher was Felix Bonilla Norat. He studied two semesters, returned to Connecticut to work in order to make money and return to the island to continue his studies. He painted signs. He worked at whatever came along. He bought a motorcycle and went to Alaska to work in the gold mines; he wanted to earn money quick! God had other plans for Vonn. After being in Alaska for four days he had a very serious accident. He crashed his motorcycle into a car. His legs and arms were severely injured. He was hospitalized for a long time. During his stay in the hospital a priest proposed a remedy for boredom: to learn to play chess or to read. Vonn preferred the books. That month he dedicated himself to studying the mystics of the church. When he left the hospital he devoted himself to working arduously; he picked fruit in the valleys of California and also worked as a dairyman. He wanted to finish his studies, so he enrolled in the University of Connecticut (1965). It was the time of the Vietnam War, and his convictions as a pacifist made him leave the United States. He goes to San Miguel Allende, Mexico, and there continues his studies. Afterwards he returns to the United States and in 1970 graduates, with honors, from the School of Fine Arts of the University of Connecticut. After graduating he dedicates himself to travel in order to enrich himself culturally. During all those years he never abandoned his dream of returning to the Isle of Enchantment, “It’s a little piece of paradise on the Earth,” as he calls it. They’ve been here for twelve years. Vonn has dedicated himself to painting. He is a great portrait painter. His creations of the farmer are extraordinary. The same is true for the Puerto Rican customs and traditions. He captures in his works with singular beauty the colors of the Puerto Rican countryside. 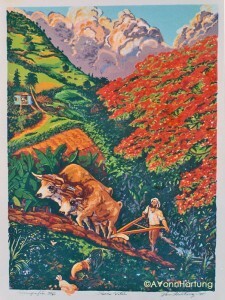 One of his creations, “Vital Furrow”, portrays the country life in places where the oxen and plow are still utilized to cultivate the land. “Thy Will Be Done”*, is a visual prayer, which the artist calls “our environmental crisis” which is really an exterior sign and evidence of an interior spiritual confusion between ourselves, our creator and creation in general. This work of art reveals two possible futures: one of evolution, harmony and continuity; the other of chaos, degeneration and destruction. The details expressed by the artist are veiled at times to motivate the imagination and participation of the viewer. The purpose of the work is to awaken a disquiet which leads us to question our apathy about the future of creation. “The choice and the responsibility are ours. Our destiny will be determined by our beliefs, our will and our own hands,” the artist concludes. 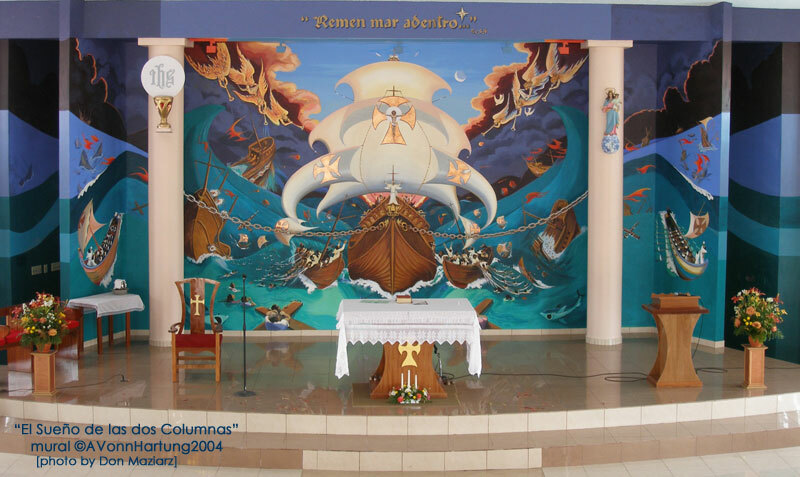 Some of Vonn Hartung’s creations are in the chapel of the Tertiary Capuchin Brothers in the Manuel Fernandez Juncos Boys’ Home in Miramar.